Sometimes, when people tell me my babies are 'good', I sort of want to shout... 'NO! I've worked on having a routine that works for us!!' But usually I smile coyly and instead spout something about being very lucky. In recent years some parenting guidebooks have terrified new parents away from routine and leaving them to fend for themselves. 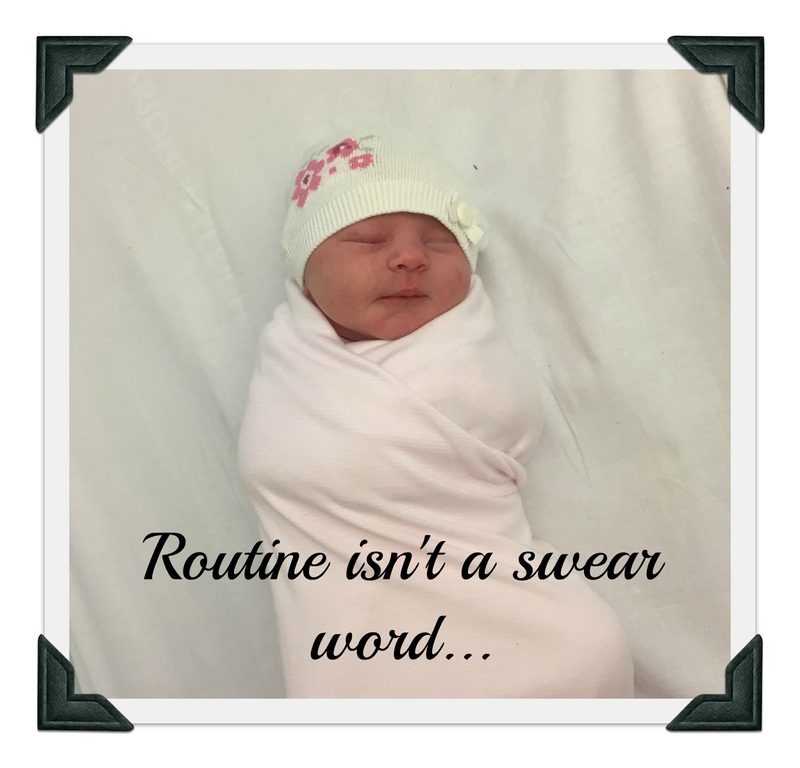 All right, maybe a little dramatic, there are lots of guides that suggest different ways to establish a routine but generally the feedback I get from new parents is that it is a little overwhelming and over complicated. It doesn't have to be. It is really simple. Decide how you want your day to work with feeds and sleeps and then label that your perfect day. You cannot have a perfect day everyday. This is fact. Babies are humans and some days they are hungrier, some days they are sleepier and some days they are just plain grumpier. If your routine goes to pot then shrug it off and start again tomorrow. It is never the end of the world and it certainly shouldn't be something to fret about. Now... I have to be honest with you and admit that I LOVE routine. For myself. To my detriment sometimes. I am that person who always gets on the train in the same place (the perfect and most appropriate place on the train), my morning routine (pre children) was timed down to the minute (i.e. 6.27, brush teeth)... I hate myself a little for admitting this out loud. So I get that I am maybe a little extreme. But the reality is, babies also love and crave routine. From incredibly early on they learn a pattern, i.e. when I wake up, I get fed; or when I am given this snuggly toy, it is time to sleep. Giving your baby signals is comforting and means that the day isn't a constant surprise to them. This world is entirely new and baffling to the little cherub, so any familiarity is a source of comfort. I like to aim for a four hour routine (it should never be more than four hours bar one long stint over night). My son got on board with this almost immediately, my daughter was on a three to four hour routine for much longer and still at 16 weeks flits between the two. But your timings may work better with a 6am or even an 8am start. As I mentioned, Camille couldn't hack 4 hours between feeds, she would sometimes feed at 7am and then 10am. And that's cool, because that is what worked for her and we made it work for us as a family. But knowing roughly when she was going to feed means I can do stuff with my big boy, I can travel at good times and I can plan feeds to work with the school run. At about 10/12 weeks, babies can manage a little longer awake. Camille now spends an hour and a half awake at each window. I tend to put her down in her pram for her sleeps in the day, this allows me to go out when I need to (particularly necessary with Seb and school runs for my niece and nephew) but also it makes rocking her back to sleep easy if she stirs. Babies commonly stir somewhere between 20 and 40 minutes into a sleep, this is totally normal and is to do with their sleep cycles. It doesn't mean that they want to wake up fully after this time as twenty minute cat naps are not great for anyone, especially a baby. The third sleep in the day is always the first to shorten. This allows babies to have their awake window before the night time sleep. Camille is more of a grazer feeder than Seb and because of this she has settled to do a split feed at this time. So she will often wake somewhere between 4 and 5 and want a small feed, she will then feed again at about 6.30/45 before going to bed. This is a really good example of where knowing and being able to read your child is paramount to a good routine. There isn't a one size fits all routine for babies, or adults for that matter! I have helped many families establish routines with their babies (both newborns and older) in the past. If you are interested in establishing a routine for your family and want a bit of guidance, do get in touch and we can work out what works best for you!